This Cannellini Bean Wild Rice Salad with sweet corn, tomato and guacamole is inspired by Mexican food but with some Italian twists. I have used typical Italian ingredients such as homemade oven-roasted tomatoes (I just love them), cannellini beans, Italian tomato paste, lemon, balsamic vinegar and basil leaves. I have used them in typical Mexican dishes like guacamole and corn salad. We enjoyed cannellini beans in many local dishes during our trip to Italy. Very popular in Tuscany, they are typically used in soups and salads. They are a firm, smaller, almost nutty version of kidney beans. I combined them with wild rice which is known for its many health benefits, its nutty flavor and firm texture. Wild rice is technically speaking not rice. It’s a type of grass grown in freshwater lakes. It’s highly nutritious, as it’s high in antioxidants and has a higher mineral and protein content than brown or white rice. Traditionally, Native American tribes survived cold long winters by eating wild rice. It keeps an “al dente” texture when cooked and has a firm, chewy texture, which works really well in salad dishes. In this dish all the different elements keep coming back in different flavors and textures. I love it when flavors repeat themselves in a dish. For example, the tomatoes are used freshly chopped, oven-roasted and in tomato paste. Basil is used fresh but also comes back in the form of balsamic vinegar. Peppers come back in the form of fresh red pepper, chili powder and Tabasco. Corn comes back in the form of sweet corn and corn chips. The different flavours, colours and textures add a bit of excitement to this Cannellini Bean Wild Rice Salad. Preheat the oven t0 150 degrees and slow roast the tomatoes for 45 or up to one hour. They should be dried out but still slightly moist inside. Leave them aside to cool down. Use any left-over juices as a dressing for the wild rice salad. Bring 4,5 cups water to a boil, stir in the wild rice and reduce heat. Simmer, covered for 40-45 minutes or until the kernels puff open. Drain and set aside to cool down. Process all guacamole ingredients in a food processor until smooth or add ingredients to a bowl and use a fork to mash them up into a smooth consistency. Add all salad ingredients to a large salad bowl and drizzle the dressing on top. Mix the dressing in well. At the last stage add the oven-roasted tomatoes and gently mix them into the salad to keep them whole. 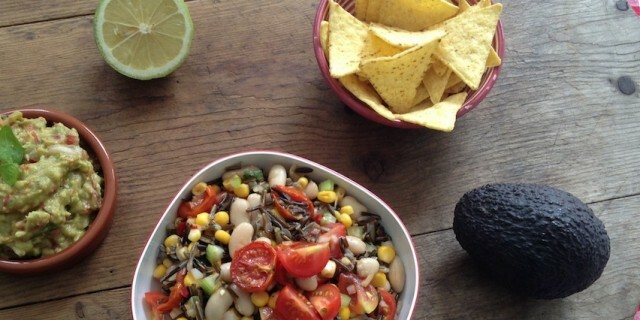 Serve this Cannellini Bean Wild Rice Salad with organic corn chips or tortilla chips and guacamole on the side.